This is a chest-on-chest that my mother gave me several years back, and she bought it from an antique dealer, a local one that basically worked out of her home. When she got it, I was probably in grammar school or high school, so I can't even remember back exactly when. I didn't pay attention to those kind of details. When we look at a piece of furniture, we look at several things to determine where's it from, how old it is. First is form. Is this a form that existed in the 18th century? Yes, it is. It's a chest-on-chest. It's got classic New England characteristics. Then we look at the material used. 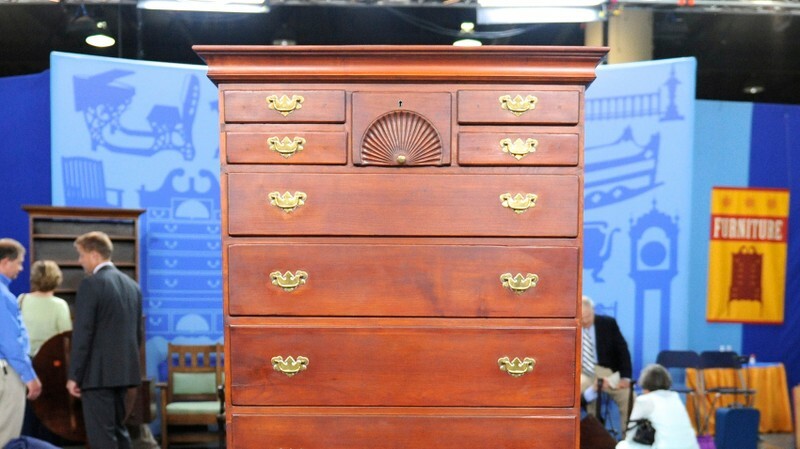 It's cherry wood, and that's something that we would expect to see in early American furniture. Another thing we look at is design and proportion. When I first saw this piece, my instant gut reaction was, "Oh boy, that's a really diminutive chest." I would expect it to be a little wider and larger and bigger. I looked at it with my fellow colleagues. You know, we want to make sure thing are consistent from top to bottom, and if we look at this top drawer, for example, you don't see any other holes around the brasses. And if we come down to the lower section, you can see these plugged holes. So that's the first thing that kind of sets off an alarm bell. So I'm not going to drag this out. My gut feeling is this is a piece that was made to deceive. First, you look at the brass history and proportion. It's a little strange. If I pull this drawer out... ...and if we take a look to the inside, you see that white paint splatter on the back boards as well as on the back of the drawer back. I think to myself, "Why is there paint splatter on the inside of a chest?" It shouldn't be there. And then if we take a look at this drawer side, this is old wood that's been scraped clean. And then I see these dovetails, and you see how they're chipped out like that? Well, that usually occurs when you have a dovetail and you try and attach a new board to it. That's an indication that something's been monkeyed around with. If we look at the back, there's, on the top section, 18th-century plain back boards, and then when you move to the lower section, they've got 19th-century vertically aligned boards. I really believe that this has got some old elements, but someone put it together to make what appears to be an 18th-century chest. Should it have been original, we would have called it a New England chest-on-chest, it would have been made about 1760 to 1780, and I suspect that someone put this together in the second quarter of the 20th century. When the value of American antiques started to go up, we began to see things like this happening. Because this is kind of made up, it's just simply got what we call decorative value. And do you have any idea what your mother paid for the piece? No. I would assume way under $500 for the time period. If this piece were to come to auction today, I could see a conservative estimate of $800 to $1,500. Sadly, the American furniture market has decreased, so should this been a period piece and without any problems, the value would only be about $3,000 to $5,000 at auction.